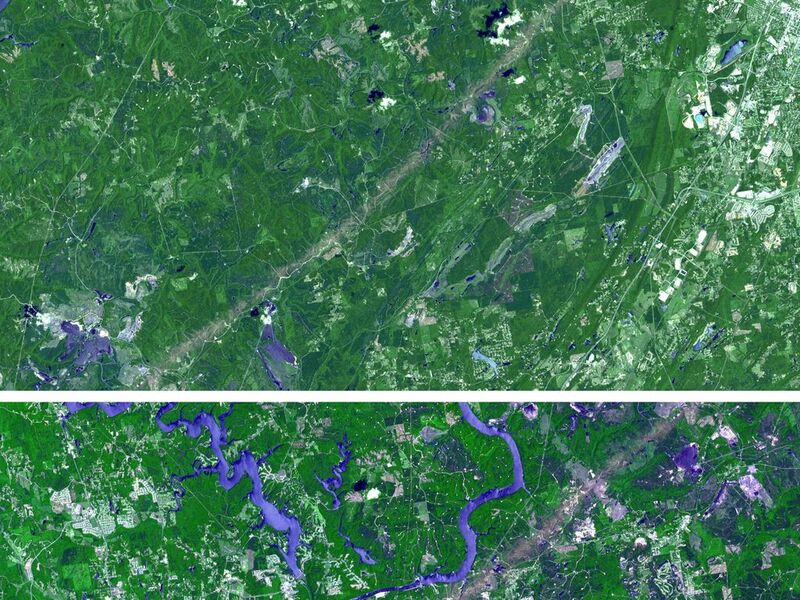 From April 25 to April 28, 2011, one of the largest outbreaks of tornadoes ever recorded ripped across the Southern, Midwestern and Eastern United States, affecting 14 states, causing widespread destruction and killing well in excess of 300 people to date, with many still missing. According to NOAA preliminary estimates, 305 tornadoes struck during the outbreak, including at least two EF-5 tornadoes, the most powerful category, with winds greater than 322 kilometers (200 miles) per hour. 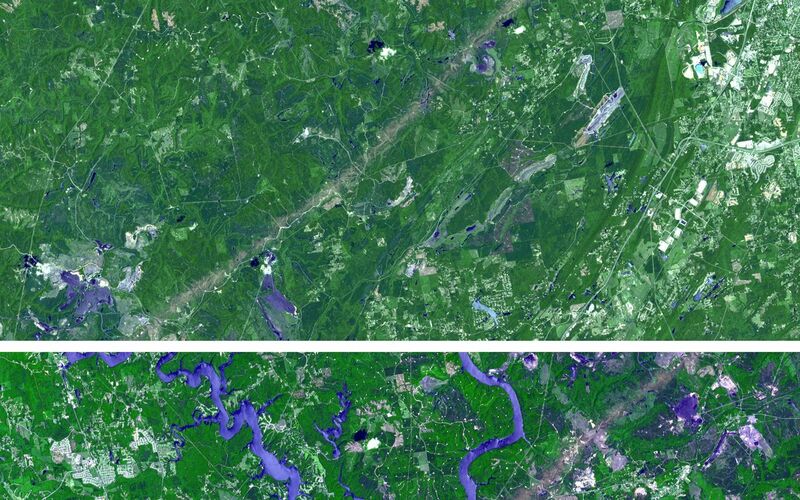 Northern Alabama was particularly hard hit. 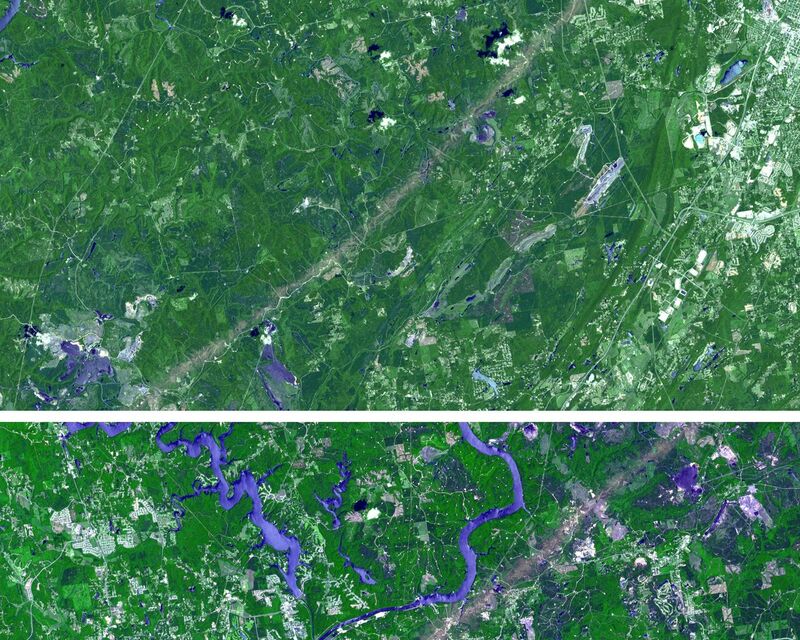 On April 27, an EF-4 tornado with winds up to 306 kilometers, or 190 miles, per hour struck Tuscaloosa and Birmingham, Alabama, killing at least 65 -- the deadliest single tornado in Alabama history and the deadliest in the United States since 1955. The tornado tracked 80 miles on the ground and had a maximum width of 2.4 kilometers (1.5 miles). 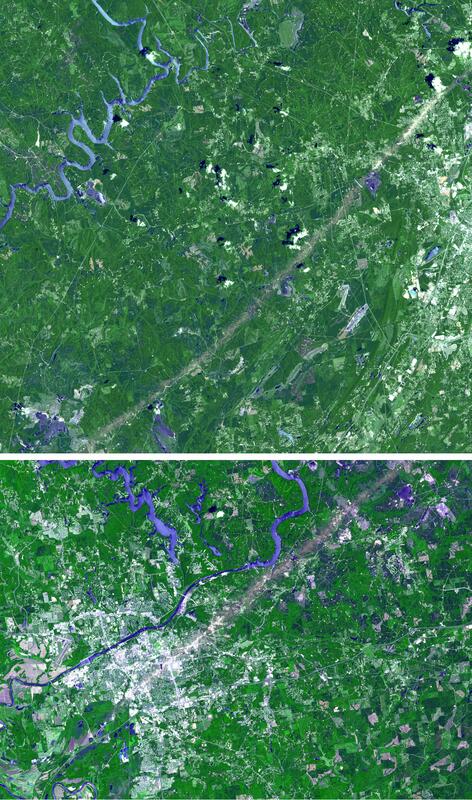 This pair of images from the Advanced Spaceborne Thermal Emission and Reflection Radiometer instrument on NASA's Terra spacecraft, acquired on May 4, 2011, shows the scar the tornado left on the landscape, visible in both images as a grayish nearly straight line extending from the lower left to upper right. 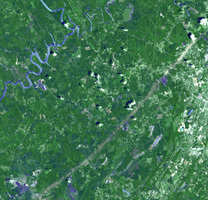 The Birmingham image covers 22.8 by 37.8 kilometers (22.8 by 23.4 miles) and is located at 34.7 degrees north latitude, 86.6 degrees west longitude. 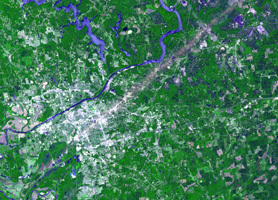 The Tuscaloosa image covers 26.2 by 36.5 kilometers (16.3 by 22.6 miles) and is located at 33.2 degrees north latitude, 87.5 degrees west longitude.